Broward Crime Stoppers Unveils New Website - Amplification Inc. 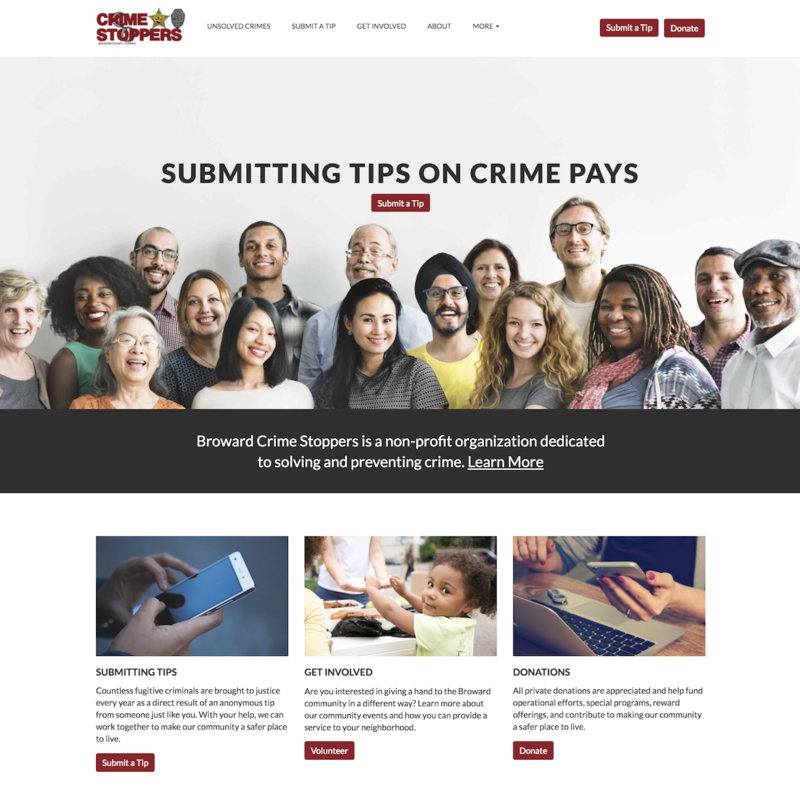 The new website for Broward Crime Stoppers offers a fresh, modern look and feel, and better functionality that makes it easier to submit a tip. DAVIE, Fla. – January 22, 2018 – Crime Stoppers of Broward County is delighted to unveil a new website created in partnership with long-time digital marketing agency Amplification Inc., reaffirming the organization’s commitment to providing the community with the essential tools needed to keep citizens safe. The new website makes it easier for citizens to interact with the organization and assist local authorities in bringing criminals to justice as a direct result of an anonymous tip. Together with Crime Stoppers, citizens have helped clear more that 22,000 cases since 1981. The new site provides clear pathways for citizens to interact with the organization in many ways. Visitors can now more easily submit a tip, and support the organization by volunteering or with a donation. One page that was significantly upgraded is the Unsolved Crimes gallery, where visitors can see the latest listings of unsolved crimes in their community. The new functionality allows visitors to sort by type of crime, open cases, closed cases and see whether a reward has been issued. 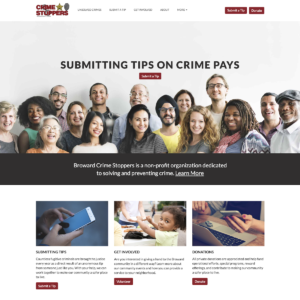 “Our re-designed website gives citizens an easier way to interact with the organization, making sure they have access to a current listing of unsolved crimes in Broward County,” said Paul W. Jaworski, CPP, Broward Crime Stoppers President & CEO. “Using the latest technology, the new site is easy to navigate and has the most up to date information. In addition to the site’s improvements, we’re making it easier than ever to download our mobile App, P3. Anyone who uses the app can create their own numeric passcode further securing their anonymous tip.” explained Jaworski. One of the core concepts behind the redesign was giving ordinary citizens more power and control with tools to keep their local neighborhood safe. “The new site’s re-design was focused on making sure citizens felt confident providing tips,” said Steve Cabeza, President of Amplification Inc., who is excited about all the technical improvements of the new site. “We made sure it had a convenient, mobile-friendly architecture, including fast-loading pages and intuitive navigation. Of course, we continue to use the latest state-of-the-art encryption technology to safeguard citizen’s anonymity.” said Cabeza. As a specialist in enhancing the online presence for brands and organizations, Amplification Inc. is proud to count Broward Crime Stoppers among its clients, working with them for several years to create visibility across a wide variety of social and digital channels. Amplification partnered with Skylarq Digital to develop the new site. Crime Stoppers of Broward County is a nonprofit organization dedicated to solving and preventing crime in Broward County, Florida. Founded in 1981, Crime Stoppers serves as a clearinghouse for tips and acts as a liaison between anonymous citizens and law enforcement agencies. Crime Stoppers does not collect any personal information from citizens, ensuring their identities are fully protected. For more information, call (954) 817-6453 or visit http://www.browardcrimestoppers.org/. With more than 75 years of combined experience, Amplification Inc. (https://amplificationinc.com/) creates budget-friendly, integrated digital marketing campaigns that bring your brand to life, enhance your online presence, and drive traffic to your website. Amplification Inc. specializes in developing and utilizing video resources as the centerpiece in a comprehensive content strategy to extend branding, lead generation and sales throughout all online channels. They offer expertise among a variety of industries, including retail, entertainment & hospitality, politics & government, law enforcement, health care, legal services, technology services, health and fitness, real estate, talent recruiting and interior design. Amplification Inc. effectively and efficiently delivers client-specific messaging across a broad spectrum of channels and media.